Hey, everyone! If you're like me, you love having the important books on your Kindle. All of Florence's works are in the public domain, so I took the three that I could find and compiled them into a volume. Enjoy and make your dreams come true! 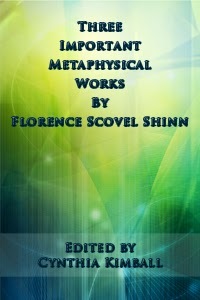 Three Important Metaphysical Works by Florence Scovel Shinn. ePub - for most other eReaders. I've been thinking about my spideys. One came to me the other night after almost two months of no spidey'ness. He was bringing a message and it took some reading, and I quickly understood it, but this isn't what this post is about. As I mentioned the first time I had a 'reality jump', I'd always believed that different realities existed simultaneously, but seeing it happen in front of my very eyes was a definite "Woah" moment. As this latest of spideys came to call and I realized what he was here to tell me, I had some time to consider him and had a bit of an epiphany as I thought about him and about the spider that had disappeared and reappeared clear across the room in the blinking of an eye. Dreams In Hand is now available. I am very excited about this particular release as I have seen how my thoughts and dreams bring about my life. The poems in this volume will hopefully inspire others as they make their dreams come true. Available in both print and eFormats. For current availability, check my author page. 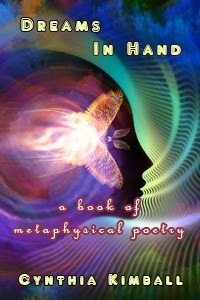 Dreams In Hand - a new book of poetry. Coming Soon. Okay I am both excited and nervous to announce I am releasing a book of poems I have written. You know, sending out fiction is by far easier than sending out poetry as each poem feels like a piece of my soul. But, I really want to share these. As you know, I have been on a metaphysical journey for seven or eight years now. Lately I have been working through the teachings of Neville Goddard and Florence Scovel Shinn. They make so much sense to me and I have literally been able to watch my life change into my dreams. All of the poems in this book were written after I began studying Neville and for those who are familiar with his teachings, they should ring a few bells. But even if you haven't read him, I hope they will give you hope, make you smile, laugh, cry, and feel excited to move forward with whatever your dreams are. Coming Soon! In both eBook and Print. Don't help. Don't get in the way. So, you are on track, right? You've read your current guru's books, are doing what they've told you, feeling good...and yet, nothing's happening? Surely that couldn't be? So, being the good human you are, you try and 'help'. I hate to tell you this, but your 'helping' just slows everything down. Yep, it does. Whatever you choose to call it (universe, source, divine mind, god - I will refer to this power as Divine Mind for the rest of this message) knows what it is doing and doesn't need any help from a human, thank you very much. So every time you try and 'help' you actually throw things off and lengthen the time between when you ask and when you receive. Relax. Affirm. Enjoy. Feel good. Laugh. Have fun. Show your gratitude for everything you have been given (and yes, that includes your dreams).